The Costa Brava - a coastal region of north-eastern Catalunya, Spain, in the comarques of Alt Empordà and Baix Empordà, in the province of Girona. Costa is the Spanish and Catalan word for 'coast', and "Brava" means "Rugged". Originally a fishing area, the Costa was developed for tourism in 1950. The area has an excellent summer climate and lovely beaches. Whilst part of the Costa Brava coastline offers itself to tourist developments on a very large scale, other areas have retained a more traditional look and have become "hidden gems" for visitors who want a little more than sun, sand and sangria. Small towns like Cadaqués have attracted artists such as Salvador Dali and Pablo Picasso and are now fashionable resorts. As well as the major resorts featured below, the coast between Roses and Tossa de Mar has many delightful small coastal towns such as Pals, Begur, Tamariu, Calella, Llafranc, and Aigua Blava. Centrally located this is a spacious top floor apartment close to the town centre, beaches and all amenities. Sleeping up to 4 people in two double bedrooms, the accommodation is centrally heated, double glazed and air conditioned. It has a brand new kitchen, bathroom and separate toilet and a large lounge with dining area and balcony. Fridge, freezer, washing machine, microwave, television etc. are all provided along with sheets and towels. This is a residential block of flats and guests are asked to please consider their neighbours. Sitges, a gorgeous and cosmopolitan town by the sea. Situated only 30 km from Barcelona (just half an hour on the train), Sitges is one of the loveliest seaside towns in Catalunya. Beautiful long sandy beaches, a stunning old town, great shopping, and lively bars, restaurants and nightclubs all combine to make Sitges the perfect holiday destination. The town (20,000 inhabitants) is known for its Carnival - one of the most famous in Spain, it takes place in late February.. Sleeps 4. This luxury design villa, minimalist design, is located in a mediterranean natural park, protected area, in the SITGES HILLS (Olivella) situated at ten minutes from the beach of the village of Sitges, an authentic beach town, and thirty minutes driving from the city of Barcelona. The house has a private swimming pool surrounded by a large sundeck with sun beds, two or three double bedrooms, one quadruple bedroom, one single bedroom, three bathrooms (one with hydro massage and jacuzzi), a fully equipped kitchen, a large garden and terraces at various sites of the house. The house has WIFI Internet access, television, DVD and a HIFI set with iPod connection. Complete gym including fitness and weights equipment. Furthermore the house is equipped with central heating, solar heating panels, design chimney, washing machine, dryer and dish washer. Car advised to visit the area. The owners live seasonally in an attached independent apartment in the property, so they could help you during your stay. Sleeps 11. 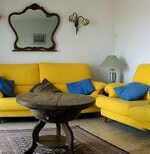 Almiral de la Font is a luxuriously restored masia just south of Barcelona. Staying at Almiral is a unique experience: renovated with great care and attention to detail, this beautiful ‘masia’ (Catalan manor house), offers high-tech modern comforts whilst retaining the historic charm and character of the original building. Set high on a hillside near the Pinedes wine region, the masia is surrounded by the Garraf National Park and offers dramatic sea or mountain views from every room or terrace. This tranquil haven has more than 300 acres of private grounds with vineyards, olive groves and fruit trees, yet is only a 30 minute drive from Barcelona and 10 minutes from the lively beach resort of Sitges. Sleeps up to 24. This cool, modern, house in one of the most prestigious areas of Sitges, only a couple of minutes drive away from the town centre. The views from the house are breathtaking, encompassing the whole of Sitges and the Mediterranean. There is parking for two cars, and also a bus from to Sitges centre if you dont want to walk the 20 minutes down to the beach. From a discrete entrance from the street you enter and walk up a flight of steps that merge into the landscaped garden. Surrounded by greenery, palms and native Mediterranean plants the garden provides a lush welcome to the contemporary style house. 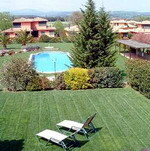 There are lovely communal gardens surrounding the fabulous communal swimming pool. From the front door, you enter into the large open living area with cool marble floor. It is tastefully decorated with the white of the walls, contrasting with the colours and textures of original pieces around the world. Sleeps 10. 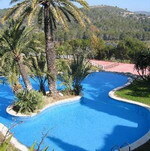 3 bedroomed house with own garden in delightful urbanization in the hills not far from the Costa Brava. Clean, spacious house with 3 bedrooms, bathroom, kitchen and living room/dining area. 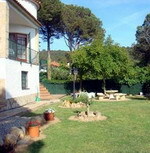 The property enjoys beautiful woodland views and is an ideal location for travelling by car to the Costa Brava beaches. It has a communal swimming pool. The village house comprises 3 bedrooms in total; 2 double, 1 twin. The property also has 1 single sofa bed located in the Lounge. This gives room for up to 7 people. Bed linen and towels are provided for your use. The village house has 1 bathrooms and 1 WCs for your party's use. Air-conditioning keeps the village house cool. Central heating keeps you snug and warm. The village house has television video, dvd, satellite/cable. The music system will play cds, radio. Sleeps 7. 3 bedroom luxury villa with terrace, lawn, barbecue and private pool located in quiet residential area, only 1km from historic Calonge. The Villa and surrounding areas. This recently completed villa, built in the Catalan style, is situated in a quiet residential area, just 1km from the centre of the historic town of Calonge. The villa sleeps 6 people in 1 large double bedroom with luxury ensuite bathroom and 2 twin bedded rooms sharing a family bathroom. There is an additional WC downstairs. There is a terraced area off the upstairs hallway which catches the afternoon and evening sun. Downstairs is a fully fitted luxury kitchen, including a dishwasher and microwave, and utility room with a washing machine. The spacious living areas are open plan and furnished to a high standard for your comfort. Two sets of patio doors lead from the living area to an outdoor terrace. The landscaped gardens extending round the villa are fully enclosed, with a kidney shaped swimming pool, BBQ, sun terrace and lawn. Sleeps 6. A complex and luxury resort of new apartments (S´ABANELL) situated in Blanes (Costa Brava) along the seafront and beaches ajoined by gardens, fountains and wonderful swimming-pools. 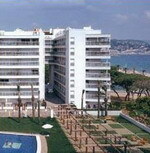 The apartment boast ample balconys and panoramic vies of the Blanes sea front. The apartment is finished with good quality and modern equipment and contains everything you could need for a pleasant stay. The apartment comprises 2 bedrooms in total; 1 double, 1 twin. The property also has 1 double sofa bed. This gives room for up to 6 people. Bed linen and towels are provided for your use. The apartment has 1 bathrooms and 1 WCs for your party's use. Air-conditioning keeps the apartment cool. The apartment has television and home cinema with video, dvd. The music system will play cds, radio. Recreational activities available with the apartment include a snooker/pool table, table tennis. Sleeps 6. 3 bed property, sleeps 6 situated on TorreMirona Golf & Spa resort, private shared swimming pool for select horseshoe of houses set amidst the golf course with spectacular mountain views. Nestled in the verdant green of the TorreMirona Golf & Spa Resort, Villa Amora is a 3 bedroomed semi-detached property equipped to the highest standards - a true home from home. Spectacular views towards the distant snow-capped Pyrenees Mountains beyond the manicured gardens and large blue swimming pool. The house is modern yet preserves a quaint Spanish feel to it, with its narrow tiled staircase up to the master bedroom with twin beds, ensuite bathroom and own small dressing area. Two further twin bedded rooms with family bathroom between are situated on the ground floor completing the sleeping arrangements. A fully fitted kitchen with excellent range of cooking utensils, fridge freezer, microwave oven, hob and oven, washing machine, iron and ironing board allow you complete control over domestic arrangements. Sleeps 6.